CounterPoint® is an American manufacturer of Point-Of-Purchase counter mats. Our unique manufacturing process utilizes high quality polymers, plastics, and base materials not normally available from local printers and generic POP suppliers. Our sister company DIGISPEC® is a popular and well-respected manufacturer of promotional mouse pads. In fact, CounterPoint® was formed in 2001 to provide a primary market focus for the Digispec® counter mat line. Our newest family member, VISSTUN® Visually Stunning Custom Cups, is creating a whole new genre of quality printed promotional cups. In addition to 30-plus years of manufacturing experience, our quality and service have been recognized with a variety of industry awards. 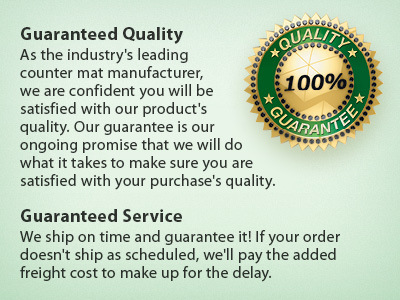 Take advantage of our experience on your next project and find out why CounterPoint® is America's leading counter mat manufacturer. We have renamed our Heavy Duty and Standard Duty counter mat products. Heavy Duty is now called Super Duty and Standard Duty is now called Heavy Duty. The change was made to align the product names with the evolution of the counter mat market. Years ago, when CounterPointÂ® first started making counter mats, we called our premium built counter mats "Heavy Duty". As years passed and competitors entered the market, they also called their rubber backed mats "Heavy Duty". However, competitor's products do not have our exclusive Supported Adhesion Coating (SAC) and are not as durable. Several years ago we introduced our "Standard Duty" mats with a construction and price point similar to competitor's heavy duty products. To make it easier for our customers to select the correct product, we have changed our product's names to reflect their construction, durability, and market perception.